NEW CASTLE (July 24, 2018) – Following a 14-month review of Delaware’s opioid use disorder treatment system, a research team from the Johns Hopkins Bloomberg School of Public Health and the Bloomberg American Health Initiative today recommended four major strategies to achieve the state’s goal of a system of care that is accessible, evidence-based, individualized, comprehensive and accountable. Increase the capacity of the treatment system. Engage high-risk populations in treatment. Create incentives for quality care. Use data to guide reform and monitor progress. 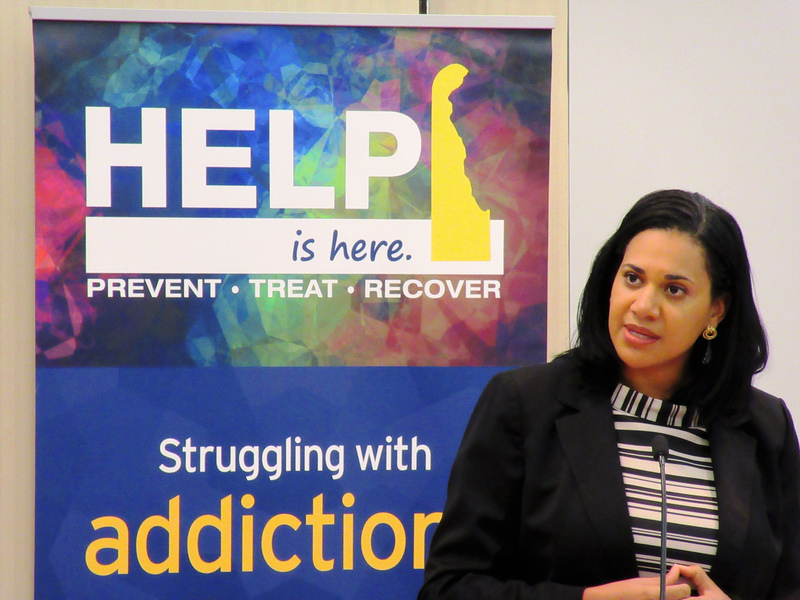 In April 2017, Department of Health and Social Services Secretary Dr. Kara Odom Walker asked a team of researchers and clinicians from the Johns Hopkins Bloomberg School of Public Health to conduct the review by meeting with state officials representing multiple agencies, behavioral health organizations, treatment providers and patient advocates, and by studying data on Delaware’s epidemic, available literature, and the experiences of other states and localities. In 2017, 345 Delawareans died from overdoses, according to the Division of Forensic Science (DFS). That total was up about 12 percent from 2016. In 2016, the report says, Delaware’s overdose rate tied for ninth (with Rhode Island) among all states at 30.8 deaths per 100,000. Through July 23 of this year, 145 people have died from suspected overdoses in Delaware, according to DFS. The Overdose System of Care will involve establishing consistent EMS and emergency department protocols to improve acute response, initiate medication-assisted treatment to manage withdrawal, and rapidly engage individuals into SUD treatment. Additionally, the bill enables the establishment of stabilization centers, which could provide medical management for individuals who have overdosed or who require acute management of SUD. The ultimate outcome of system implementation is a reduction in morbidity and mortality and improved engagement into SUD treatment. In embracing another recommendation of the Johns Hopkins report, DHSS’ Division of Substance Abuse and Mental Health (DSAMH) will begin contracts this summer with providers to increase access to care, peer support and effective treatment for individuals living with substance use disorder. In addition to meeting individuals’ treatment needs, the new centers also will address needs for medical care, housing, vocational opportunities, education and other wraparound services. Increasing treatment capacity: Recommendations include DHSS’ Division of Substance Abuse and Mental Health (DSAMH) implementing a Centers of Excellence-type program to provide rapid intake and assessment, treatment, peer services and access to chronic disease management; DSAMH creating an online inventory of all credentialed treatment providers; DHSS leading a campaign to increase the number of providers who prescribe buprenorphine; and DHSS developing a plan to support housing and employments for individuals in recovery. Engaging high-risk populations in treatment: Recommendations include the Department of Correction offering opioid use disorder treatment that includes all FDA-approved medications to all individuals in detention facilities; the state upgrading the three existing withdrawal management centers; and DHSS setting standards for hospital provision of SUD treatment for medication-assisted treatment and the use of peers. Creating incentive for quality care: Recommendations include DSAMH reviewing its current rates to ensure there is adequate and consistent reimbursement for high-quality care; DHSS’ Division of Medicaid and Medical Assistance (DMMA) ensuring that current value-based payment initiatives applied through Managed Care Organizations (MCOs) are extended to opioid use disorder treatment; and DHSS, in partnership with other state agencies, developing a compliance strategy. Using data to guide reform and monitor progress: Recommendations include DHSS developing a dashboard that collects and publicizes statewide data on treatment capacity, utilization and quality indicators; DHSS overseeing a linkage project that brings together multi-agency data for understanding system effectiveness and identifies opportunities for improvement; and DHSS evaluating program and policy changes and rapidly disseminating findings to facilitate continuous improvement. The Department of Health and Social Services is committed to improving the quality of life of Delaware’s citizens by promoting health and well-being, fostering self-sufficiency, and protecting vulnerable populations.